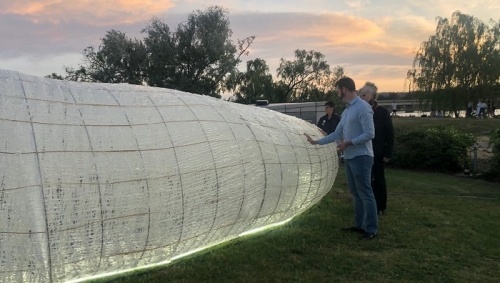 AS the unmistakable strains of “Some Enchanted Evening” played on the National Carillon, the DESIGN Canberra Festival, now in its fifth year, was launched at sunset yesterday (November 4) on Aspen Island with a large installation as its centrepiece. Chief Minister Andrew Barr, flanked by representatives of the National Capital Authority, Arts Minister Gordon Ramsay and the event’s many sponsors and guests, was on hand to open an activity which celebrates the recognition of Canberra as a global city of design. The centrepiece of the occasion was the artwork, “Namako”, meaning sea cucumber, (trepang/ bêche-de-mer). It was created by the celebrated Japanese architect and professor at the University of Tokyo, Kengo Kuma, and is currently installed at the base of the carillon with the invitation to touch but not climb upon. Prof Kuma spoke very briefly to the crowd, but his installation will be up until November 25 on Aspen Island, with weekend festivities around it. This year, there will be more than 100 events, talks, exhibitions, tours, activations, markets, collaborations, artist studios and open homes. Highlights include installations at the Canberra Museum and Gallery, colourful outdoor graphic installations, original one-off and small-scale pieces of design to be auctioned off on November 10 and an exhibition celebrating Italian-born, Canberra-based Enrico Taglietti, one of the world’s greatest mid-century architects. Festival party, Level 1, Monaro Mall, Canberra Centre, 8pm, Saturday, November 10. 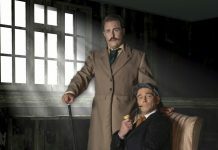 Bookings to designcanberrafestival.com.au or tickets at the door. A woman has been rescued by firefighters in breathing apparatus from a unit fire on Chandler Street, Belconnen, this morning.